At first, the idea of adding life skills to your homeschool curriculum might seem like a silly idea. If you’re anything like me you’re thinking, “Well, it’s life. We do a lot of that here so…we’re good.” But, the truth is, my kids could use some more life skills and something more structured to focus our efforts on would be great! I admittedly haven’t been as proactive in this department as I should be. I’m a confessed “I’d rather do it myself” kind of mom. I’m not proud of it, but keeping my kids accountable with chores and the like has not been my strong suit as a parent. Now with one in college who’s planning on dorm life next fall and another entering 7th grade, I’m hyper aware of the young men they are and the life skills they need (and sometimes lack). Have you considered adding life skills to your homeschool curriculum line-up this year? Benefits of adding life skills to your homeschool curriculum line-up. Organized approach. Having a program to follow with specific skills planned out in advance will make it easier to stay accountable. Knowing what skills to look forward to throughout the year might also help motivate your child. Record keeping. It’s hard to keep track of life skills learned. So much instruction happens naturally in homeschooling, but when you really think about it, we don’t give our kids enough credit for the jobs they do. Print out certificates of completion and add them to your child’s portfolio. Learn new skills along with your child. Confession: I don’t have any idea how to change a tire. I’m sure there’s plenty of other things I’d learn along with my children’s life skills study. Cover skills outside of your own comfort zone. I don’t want my kids limited to the skills I have or the skills I feel comfortable teaching (see above). We all have different gifts! I’m sure we’d come across lots of topics I wouldn’t naturally cover on my own and that is a good thing. Can be counted as high school credit. There are so many courses available to high schoolers. Look for courses outside the title “Life skills” or “Home Economics”. Although those would obviously be perfect, there are also more specific life skills courses available such as Personal Finance or Leadership Management Skills. 10 Areas of Essential Life Skills for Teenage Boys by Michelle Caskey of Homeschool Your Boys has a great printable list. These skills would be great for a girl too, obviously. Spend the year tackling these 50+ Tasks for Teenagers to Learn to Prep for Adulthood from Shannon at Middleway Mom! Practical Life Skills for the Gifted Teen, a post series by Renee at Great Peace Academy, is filled with information worth bookmarking. Although gifted ed is Renee’s niche, this series would be perfect for all teens. Her series covers topics like cooking, finance, and home management. The Awe-Filled Homemaker has a great Life Skills Checklist. Print and add to your child’s portfolio as you keep track of the skills she masters. If you need to know you’re not the only mom failing your teens in the life skills department check out Don’t Fail Your Kids by Dachelle of Hide the Chocolate and enjoy a good laugh about parenting teens. Check out this Life Skills Bingo printable pack from Ginny at Not So Formulaic! Even if you’re not in the mood for bingo, she has a fantastic life skills post series worth reading. More life skills resources to check out! Raddish Kids is a cooking club for kids. Their monthly subscription box is perfect for kids who love to get in the kitchen. Each month your child gets a new menu with detailed instructions for shopping, preparing, and cooking a meal. How fun! SkillTrek is multi-media instruction for all ages. These video lessons are the kind of thing I need for my boys! My husband isn’t the type of dad who’s out in the driveway working away on auto mechanics. (No offense, Honey.) These videos would really come in handy! Study.com has thousands of online video courses. Most courses offer a certificate of completion. That’s great for your record book! Jam is another great site for online courses. I found it looking for drawing classes for my 12-year-old, but I found out they also have cooking classes! The offer courses for younger and older grades. I loved the chapter titles in this book. It looks like a must for any parent who’s hoping their kid can make it out there when they move out. Have your kids read this one? Effective teens? Yes, please! One of my favorite books as a wife and mom has been A Woman After God’s Own Heart by Elizabeth George. Reading it both challenged and blessed me. I love these this series for teens. They also have A Young Woman After God’s Own Heart. Each book lays out biblical principles for healthy living. 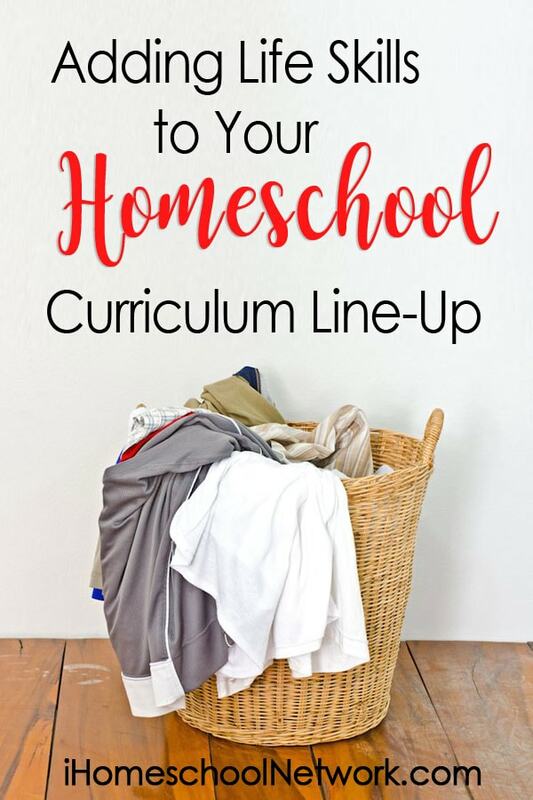 Have you considered adding life skills to your homeschool curriculum line-up? Oh man! This post changed my whole outlook! I’m only preschooking my girls now but reading your article made me think back to how unprepared I was when I left home and I don’t want that for my girls!! I even found a bunch of resources I want to read! Thankyou so much! !